Walmart reached a very special renewable energy milestone this week. The mammoth retail giant revealed San Diego’s College Avenue store as it’s 100th store in California to use rooftop solar panels. It’s all part of the broad range plan to have 100% of their energy come from renewable sources. “By using one of California’s greatest resources – sunshine – and employing renewable technology with our California-based partners, we will continue developing solutions that are both good for the environment and good for business,” she said. On average, 48 contract positions per site have been created through Walmart’s solar commitments. The retail giant has worked with Californian-based solar company SolarCity to help create more than 3,000 California contract construction jobs. Meanwhile, SolarCity has hired 1,213 new employees since taking on its first Walmart project back in September 2010. While Walmart’s run of sustainable development in solar energy by teaming up with SolarCity has been good for job creation, it also has an extremely positive effect on the environment. Accordiing to Walmart, its efforts in going towards solar power in California will create 70 million kilowatt-hours (kWh) of renewable clean power each year. That’s approximately the same as powering more than 5,400 homes. It also means 21,700 metric tonnes of carbon dioxide each year will be taken out of the atmosphere, or the same as 4,100 cars off the road. Meanwhile, solar power will give about 10% to 30% of the facilities’ electricity needs. “Walmart is showing other businesses that you can create jobs and reduce air pollution by using better energy,” said SolarCity CEO Lyndon Rive in a statement. “In Walmart, other businesses seeking efficiency and smart energy policy have a strong example to follow,” he said. Los Angeles leads the way with 43 stores that have solar technology installed, followed by the Bay Area with 17 stores, and San Diego with 13. Local politicians and environmentalists applauded the recent milestone. 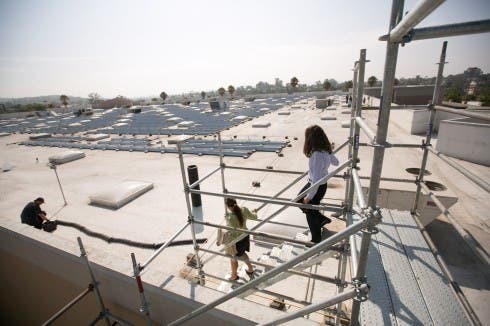 “Walmart has demonstrated a real commitment to solar energy systems here in San Diego and throughout California, and hopefully other companies will make the move to do the same on their rooftops,” said Tony Young, San Diego City Council President in a statement. “This latest renewable energy effort is another step forward in San Diego’s clean-energy mission and will help make our city a better, more sustainable place for current residents and our next generation,” he said. “Walmart does not just talk the talk, it walks the walk,” said Mary D. Nichols, Chair of the California Air Resources Board in the statement. “Walmart’s work to expand and accelerate its solar power initiative program here in California demonstrates its commitment to sustainability. Walmart has helped create local jobs, reduce costs for its own operations, and protect the environment. We encourage other businesses to follow Walmart’s lead,” she said. Meanwhile, Gwen Ruta, vice president of Environmental Defense Fund’s Corporate Partnership Program, in the statement praised WalMart’s work on promoting the green economy with it’s 100th solar installation in California.